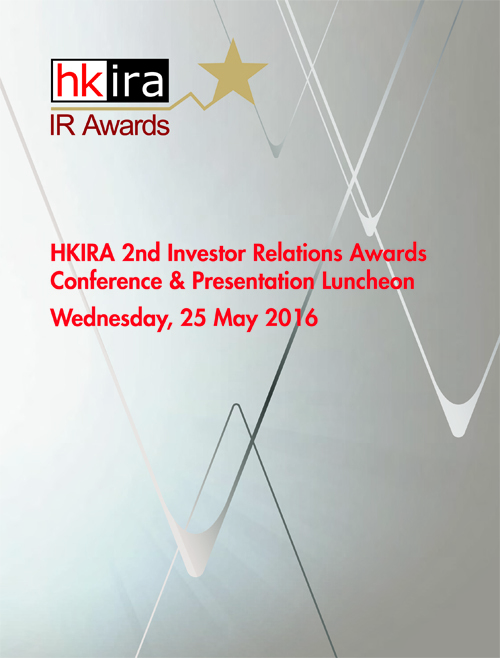 We are proud to congratulate all the award winners of the HKIRA 2nd Investor Relations Awards, which honor their IR excellence and best practice. Congratulations are also extended to all the nominees in recognition of their efforts made in pursing IR best practice. 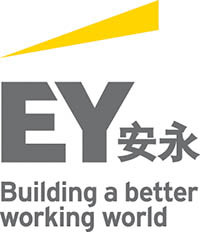 0520 Xiabuxiabu Catering Management (China) Holdings Co., Ltd.
0023 The Bank of East Asia, Ltd.
0345 Vitasoy International Holdings Ltd.
2362 Jinchuan Group International Resources Co. Ltd.
0038 First Tractor Co. Ltd.
0098 Xingfa Aluminium Holdings Ltd.
0119 Poly Property Group Co., Ltd.
0123 Yuexiu Property Co. Ltd.
0142 First Pacific Co. Ltd.
0152 Shenzhen International Holdings Ltd.
0198 SMI Holdings Group Ltd.
0210 Daphne International Holdings Ltd.
0217 China Chengtong Development Group Ltd.
0256 Citychamp Watch & Jewellery Group Ltd.
0268 Kingdee International Software Group Co. Ltd.
0313 Richly Field China Development Ltd.
0386 China Petroleum & Chemical Corp.
0390 China Railway Group Ltd.
0517 Cosco International Holdings Ltd.
0548 Shenzhen Expressway Co. Ltd.
0552 China Communications Services Corp. Ltd.
0636 Kerry Logistics Network Ltd.
0728 China Telecom Corp. Ltd.
0752 Pico Far East Holdings Ltd.
0816 Huadian Fuxin Energy Corp. Ltd.
0819 Tianneng Power International Ltd.
0832 Central China Real Estate Ltd.
0836 China Resources Power Holdings Co. Ltd.
0951 Chaowei Power Holdings Ltd.
1070 TCL Multimedia Technology Holdings Ltd.
1112 Biostime International Holdings Ltd.
1171 Yanzhou Coal Mining Co. Ltd.
1369 Wuzhou International Holdings Ltd.
1443 Fulum Group Holdings Ltd.
1836 Stella International Holdings Ltd.
1980 Tian Ge Interactive Holdings Ltd.
2014 Ozner Water International Holding Ltd.
2120 Wenzhou Kangning Hospital Co., Ltd.
2601 China Pacific Insurance (Group) Co. Ltd.
2618 TCL Communication Technology Holdings Ltd.
2689 Nine Dragons Paper (Holdings) Ltd.
3688 Top Spring International Holdings Ltd.
3836 China Harmony New Energy Auto Holding Ltd.
3883 China Aoyuan Property Group Ltd.
3933 The United Laboratories International Holdings Ltd.
3969 China Railway Signal & Communication Corp. Ltd.
6161 Target Insurance (Holdings) Ltd.
6878 Differ Group Holding Co. Ltd.
6896 Golden Throat Holdings Group Co. Ltd.
8207 Credit China Holdings Ltd.
We would also like to express our sincere gratitude to all those who have participated in the HKIRA 2nd IR Awards. Your contribution is essential in making the inaugural launch a great success.